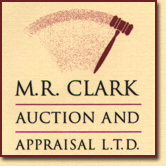 M. R. CLARK AUCTION & APPRAISAL L.T.D. is a full service company committed to delivering the highest quality service and professionalism to our clients. As a member in good standing with the Missouri Professional Auctioneers Association, the National Auctioneers Association, and the Certified Appraisers Guild of America, Michael Clark offers the integrity and knowledge necessary to help our clients meet their needs on a cost effective fair and timely basis. "When comparing Auction firms, average is not enough. A successful Auction doesn't just happen, it is planned that way." This is the place to find the latest information about upcoming auctions as well as a complete brochure describing our many services. Bookmark this page and check our Auction Calendar frequently.